Howard Hawks remade "Rio Bravo" twice and Eugene Lourie remade "The Beast From 20,000 Fathoms" twice. In 1967 Howard Hawks remixed "Rio Bravo" for the first time as "El Dorado". The feature starred Wayne not as the Sheriff, but one of his friends. The sheriff was portrayed by Robert Mitchum in a hybrid blending of Wayne's original role and that of Dean Martin's drunken deputy. James Caan portrayed a variation on Ricky Nelson's young gunfighter and character actor Arthur Hunnicutt was Walter Brennan's old timer. While new comer Charlene Holt's role was a reworking of Angie Dickens's gambler with a past and Wayne and Mitchum's love interest. Not finished in 1970 Howard Hawks remixed "Rio Bravo" for a second time as "Rio Lobo". As with the previous two pictures it starred John Wayne. The setting starts in the last hours of the Civil War and the rich rancher turns out to be one of Wayne's former soldiers. Jorge Rivero played an ex-Confederate Officer who along with his men had been captured and then befriended by Union Officer John Wayne. Rivero's role was just another change to the Dean Martin character. While Robert Mitchum's youngest son Christopher takes on the modified Ricky Nelson/James Caan character with the twist that he is the one in jail. Having been put there by the Rancher's hired Town Sheriff. Jennifer O'Neil with the hardest edge of all three pictures portrayed the recreated Angie Dickson/Charlene Holt role.. This article is not about fighting a rancher who wants to control the town and the range. 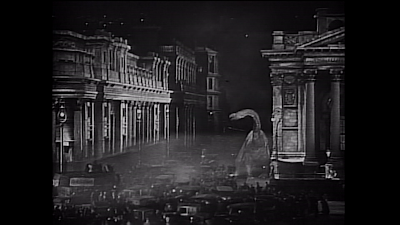 It's about Prehistoric monsters running loose in modern cities, but the concept is the same as the three Howard Hawks features. Eugene Lourie was a French film director, art director, costume designer, production designer, set designer and screenwriter. However, he was not French. Lourie was born April 8, 1903 in Charkov, Ukraine. He worked in the early film industry there, but would flee Soviet Russia in the 1920's for Istanbul, Turkey. Where he found work to raise money for a ticket to Paris, France. In France his film career took off as he did different crafts for some of that country's most famous film directors. In 1941 Eugene Lourie moved to the United States and would become involved in special effects, directing and acting. His home would be in Portland. Oregon where he would marry and raise a family. Working in the 1927 French film industry. Eugene Lourie was the Art Director and Technical Adviser for director Abel Gance's originally 5 hours and 30 minute long silent masterpiece "Napoleon". 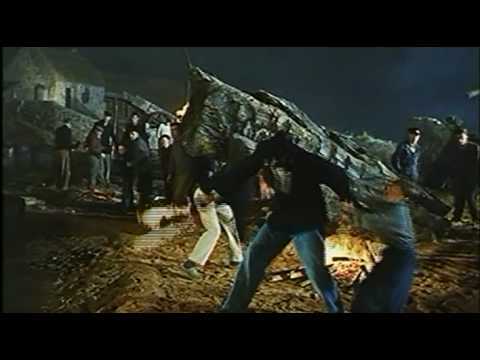 The film's climax used three cameras and three projectors to created a 180 degree widescreen sequence. This outstanding picture on the life of Napoleon Bonaparte was remastered and restored by Francis Ford Coppola with a musical score written by his father Francis Coppola in 1981. Ten Years later in 1937 we see the 34 year old Eugene Lourie as the Production Designer for Jean Renoir's "La Grande Illusion". In 1943 Lourie produced. for RKO. one of Jean Renoir's first English language films "This Land is Mine". The motion pictures cast included Charles Laughton, Maureen O'Hara and George Sanders. Moving forward to 1951 the 48 year old was both the Set Decorator and Production Designer for "The Adventures of Captain Fabian". This story takes place in and around New Orleans in 1860 and was written by and starred Errol Flynn. Some more of Eugene Lourie's 194 motion pictures and television shows included being the Art Director for Charlie Chaplin's 1952 "Limelight". The movie was heavily boycotted in the United States, because Chaplin had left the country as a result of the "House Committee on Un-American Activities" investigation into his possible Communist background. There is an interesting science fiction film released in 1958 that was directed by Lourie. It starred Ross Martin, prior to his role as Artemus Gordon on television's "The Wild, Wild, West", and child actor Charles Herbert, right before the original "The Fly" was released, called "The Colossus of New York". Mentioning science fiction the versatile Eurgene Lourie created the outstanding Special Effects for the British motion picture "Crack in the World and in 1968 he would be nominated for an Academy Award for the Special Effects seen in the "Cinerama" Production of "Krakatoa: East of Java".Even though the real Krakatoa was located West of Java. Below actor Eugene Lourie in "Krakatoa: East of Java". A cameo role that lasted a few short minutes as the lighthouse in destroyed by the tidal wave caused when the volcano Krakatoa blew up. The irony of a man killed by his own Special Effects. Mention 1953's "The Beast from 20,000 Fathoms" and most people familiar with the picture will immediately associate it with stop motion animator Ray Harryhausen. As this was his first full length feature completely animated by himself. When seven year old Lloyd first saw the picture it had been tinted Sepia as a poor man's Technicolor. Eugene Lourie was the director, production designer, special effects technician and one of the writers of the screenplay. This was both Lourie's first directing and screenplay writing assignments in his career. The screenplay was based upon a short story "The Fog Horn". about a sea monster who falls in love with a Lighthouse, which appeared in "The Saturday Evening Post" from up and coming science fiction author Ray Bradbury. One of the lead actor's lived on my street at the time of the film's release. He was Kenneth Tobey who had also been seen in Howard Hawks' "The Thing from Another World" as an Army transport pilot. In "The Beast from 20,000 Fathoms" Tobey played Army Officer Colonel Jack Evans and would appear in Ray Harryhausen's next film "It Came from Beneath the Sea" as a Naval Officer. Playing Professor Tom Nesbitt the scientist who first see's the beast was Paul Christian. Only thing was Christian wasn't his real last name. He was actually Paul Hubschmid a Swiss actor whose last name the producers and Lourie thought sounded too German for the time. They were afraid a German name as the lead in the picture might remind too many potential viewers of World War 2 that had only ended eight years before. Portraying Lee Hunter the Paleontologist Assistant to Dr. Thurgood Elsen and the love interest of Professor Nesbitt was Paula Raymond. Two time Supporting Oscar nominee Cecil Kellaway played Dr. Thurgood Elsen. The non-human star of the picture was Ray Harryhausen's "Rhedosaurus". Below are several of the early drawings made by Harryhausen for what the creature might look like. 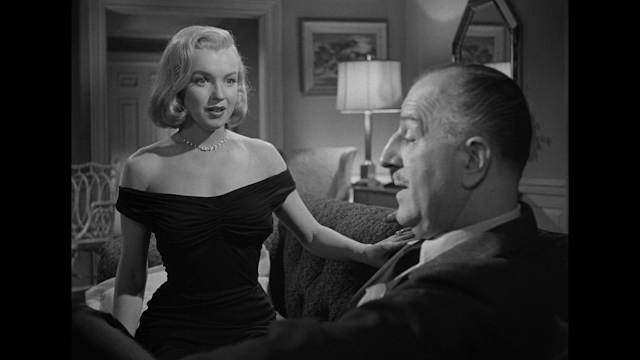 Publicity for this movie was typical for the 1950's and the producers used a gimmick that William Castle would reuse for his 1958 film "Macabre". Also for the theater owners should they want it. 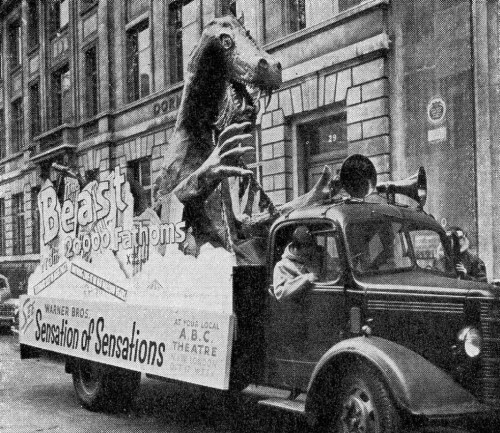 Don't laugh to much,but here is a truck in London, England used to promote "The Beast from 20,000 Fathoms". "The Beast from 20,000 Fathoms" was the first prehistoric monster on the loose motion picture and the "Rhedosaurus" was freed by an Atomic Bomb, naturally, Test in the Arctic Circle. Kenneth Tobey's Colonel Jack Evans is the military commander of the test and along with Professor Nesbitt is Dr. Ingersoll portrayed by actor King Donovan. Donovan had been seen in Ivan Tors "The Magnetic Monster" and would be seen in Don Siegel's original 1956 "Invasion of the Body Snatchers". A storm is coming after the test, but the two scientists go out to check the monitors. At one site the "Rhedosaurus" appears and Dr. Ingersoll falls into a crevice and is killed. The creature disappears into the storm before Nesbitt is rescued, but nobody will believe his story of a living prehistoric animal. Recuperating in a hospital Professor Nesbitt reads an article about a fishing boat attacked by a "Sea Serpent" off the Grand Banks. He leaves his hospital bed and goes to see Dr. Thurgood Elsen. Elsen laughs at the idea and Nesbitt returns to the hospital. However, other incidents start to occur including the destruction of a Light House. Lee Hunter shows up at Paul Nesbitt's apartment with drawings of all "The Known" dinosaurs. Nesbitt asked her "What if it's not known?" Somehow Ray Harryhausen's created "Rhedosaurus" is a "Known" dinosaur. The two convince Dr. Elsen who then goes to Colonel Evans. The four meet with Naval Captain Phil Jackson, Donald Woods, on how to search for the creature. Dr, Elsen believes the "Rhedasaurus" is heading for the only area fossil remains of its species has been found the Hudson River Canyon off of New York City. A Navy diving bell is put into use as Dr. Elsen and a Navy operator descend into the Canyon. Unfortunately for the good Doctor he finds the dinosaur who swallows the diving bell and its two man crew. The wait as to what the creature will do next is not long as "The Beast from 20,000 Fathoms" comes ashore at the docks and proceeds into town. The police attempt to shoot the "Rhedosaurus", but he literally stomps, or eats them. The ,military is called in and there is a confrontation. The "Rhedosaurus" is wounded in the neck and it begins to bleed. As the military patrols look for the beast within the caverns of New York City soldiers start to fall over ill. The creature has brought a million year old contagion in its blood and it appears there is no way to stop it. Professor Nesbitt comes up with the idea of shooting a radioactive isotope into the bleeding wound. The isotope should cause the creature's tissues to start to burn from the inside killing the beast and stopping the contagion. The beast has come ashore at Coney Island and is within the wooden roller coaster. The isotope is attached to a grenade rifle and Army Sharpshooter Corporal Jason Stone, Lee Van Cleef, will ride with Nesbitt to the top of the roller coaster to get a good angle for the shot. When the Beast is shot a fire also breaks out and it is trapped within the wooden frames of the roller coaster. The motion picture had a production budget of only $210,000 and by the end of its first year in North America had grossed over $5 million dollars. Toho Studios released their motion picture "Gojira" on November 3, 1954 in Japan. A month before the Eugene Lourie directed motion premiered in Japan on December 22, 1954. What is interesting here is the title of the working script for what would become "Gojira". Which sounds very similar to "The Beast from 20,000 Fathoms". This has led some people to speculate the motion picture was an influence on Tomoyuki Tanaka and Special Effects Technician Eiji Tsuburaya Giant Monster story. Others counter that was impossible, because of the date the film opened in Japan. I do not know the answer, but both men where in the International Motion Picture Industry and could have been aware from the trade papers, or either seen in a special screening Eugene Lourie's film. We do know that 1933's "King Kong" from Merian C. Cooper and Willis O'Brien had been re-released in Japan in 1953 and that as a boy it was one of Tsuburaya's favorites There is no debate, because it is documents that "King Kong" was an influence on Tanaka's "G" project as it was known at Toho Studios. What is fact is that Ray Harryhausen and Eugene Lourie's "The Beast from 20,000 Fathoms" started a giant monster craze that continues today. 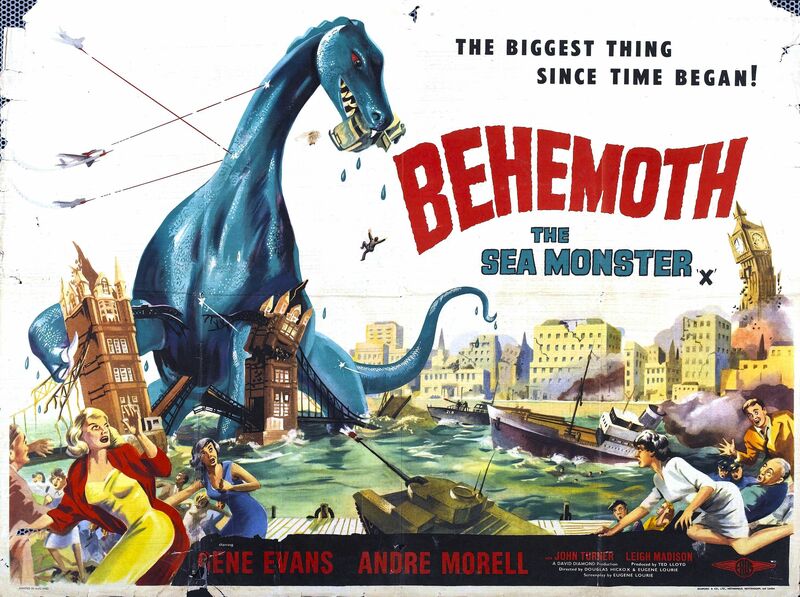 The first remix of "The Beast from 20,000 Fathoms" was the 1959 British motion picture "Behemoth the Sea Monster" known in the United States as "The Giant Behemoth". Once again Eugene Lourie was the pictures director, production designer and with this film the primary screenwriter assisted by Daniel James. The original concept from Lourie was of a blob like creature without definite form made entirely of radiation. Producer Ted Lloyd was also on board with the idea, but when they went for major funding and a distributor things changed. The distributing company "Artistes Alliance Ltd" wanted not only a giant monster movie, but an imitation specifically of "The Beast from 20,000 Fathoms". "Artistes Alliance, Ltd" had only made and distributed two previous motion pictures the year before in 1958; The first was "The Strange World of Planet X" known in the United States as "The Cosmic Monster" starring American actor Forest Tucker. The story like several science fiction movies in the UK was adopted from a television mini-series from 1956. The second motion picture was "Blood of the Vampire". The producers hired screenwriter Jimmy Sangster who had written the scripts for two motion pictures from "The House of Hammer" "The Curse of Frankenstein" and "Dracula (Horror of Dracula)". The script for "Blood of the Vampire" and cast were excellent, but this little film is mostly forgotten today. There really is no "Vampire", but a mad scientist brought back to life by a heart transplant played by David Wolfit, "Satellite in the Sky"and "Lawrence of Arabia". The cast featured Barbara Shelley, 1960's original "Village of the Damned" and with Christopher Lee in "Dracula, Prince of Darkness" and "Rasputin". Along with the motion picture version of "Quartermass and the Pitt (Five Million Years to Earth)". Besides "Behemoth the Sea Monster" "Artistes Alliance, Ltd" would produce and distribute only one other feature film in 1959 and close down. That other feature was "Life in Emergency Ward 10". Also based upon a British television series and starring Michael Craig, Ray Harryhausen's "The Mysterious Island", and Wilfred Hyde-White, "Buck Rodgers in the 25th Century". As a result of "Artistes Alliance, Ltd's" requirement for funding that blob of radiation was changed into a radioactive dinosaur. Aware that Ray Harryhausen's mentor and creator of "King Kong" Willis O'Brien was available to do the stop motion work. Eugene Lourie requested he be permitted to hire him. He was turned down. However, the work was contracted out to low budget Special Effects technician Jack Rabin located not in the UK, but Los Angeles, California. Rabin in turn subcontracted the work out to none other than Willis O'Brien for a flat fee of $5,000. The actual work on the "Behemoth" was done by O'Brien's assistant Pete Peterson. As Ray Harryhausen had on Willis O'Brien's only Academy Award winning picture 1949's "Mighty Joe Young". Below is a photo of Willis O'Brien, on the left, and Eugene Lourie, on the right. 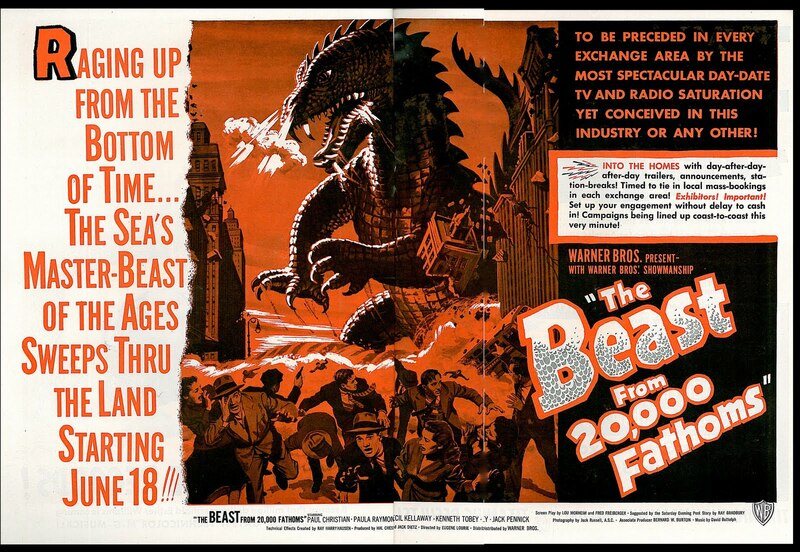 As for the screenplay Eugene Lourie instructed story writers Robert Abel and Alan Adler to basically copy "The Beast from 20,000 Fathoms" as much as possible for a British audience. There are whole sequences such as the Behemoth coming out of the Thames and moving down the streets of London that are clearly a duplicate of the "Rhedosaurus's" coming ashore at the docks of New York and entering the city. American actor Gene Evans, from director Sam Fuller's excellent Korean War Drama "The Steel Helmet", portrayed American scientist Steve Karnes. Karnes is an authority on marine life and has theories about their mutation as a result of exposure to radiation from nuclear testing. Playing Professor James Beckford was Andre Morell. Morell would be Dr. Watson to Peter Cushing's Sherlock Holmes in Hammer Film's 1959 "The Hound of the Baskervilles". The plot for "Behemoth the Sea Monster" starts out very good with a fisherman receiving a fatal dose of radiation from an unknown source and thousands of dead fish washing ashore on the beach the man was on. The two scientists go to investigate and Eugene Lourie was able to insert a version of the original blob in the story at this point. A young man touches what is tissue from the unknown creature resulting in radiation burns on his hand. A man, his son and their dog are killed by a radiation pulse and at the scene the footprint of a large prehistoric animal is found. Paleontologist Dr. Sampson portrayed by Jack MacGowran, the Vampire hunting professor of Roman Polanski's "The Fearleass Vampire Hunters", determines the creature is a Paleosaurus. This seems to confirms Steve Karns's theory about nuclear testing effecting marine life. Dr. Sampson goes in search of the creature and after discovering it in the Thames is killed. The creature comes out of the Thames after destroying a Ferry Boat and runs amok. Once more a variation of "The Beast from 20,000 Fathoms" comes when the military wants to blow up the Paleosaurus and Karns warns that could spread deadly radiation to all parts of London. Eugen Lourie's two story writers Robert Abel and Alan Adler seemed to have lifted the entire ending from Ray Harryhausen's and Charles H. Schneer's 1955 "It Came from Beneath the Sea". 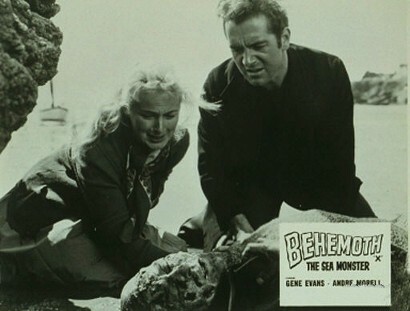 In "Behemoth the Sea Monster" we have Gene Evans's Steve Karnes using a mini-submarine to deliver a torpedo filled with radium to kill the Paleosaurus. While Kenneth Tobey's Commander Pete Mathews used an "atomic" torpedo to kill the Giant Octopus in "It Came from Beneath the Sea". The motion picture ends with Evans and Andre Morell hearing that dead fish are washing ashore on the East Coast of the United States. What is a positive for the production is seeing the detailed scales on the model of the Behemoth used. On the negative was the very low budget and the repetition of the same scenes as if they were new ones. One such repetition has the Behemoth crushing a car in its mouth. Where Eugene Lourie got the name of "Gorgo" for his title monster I could not locate. However, there were two real Gorgo"s in history. For a little Greek trivia she was the wife of Spartan Warrior King Leonidas the First. Who along with 299 fellow Spartan's held off the Persian Army at the Battle of Thermopylae Pass. The story was filmed twice by Hollywood. First in 1962 as "The 300 Spartans" starring Richard Egan as Leonidas with Greek actress Ana Synodinous as Gorgo and in 1998 as "300" starring Gerard Butler as Leonidas and Lena Headley as Gorgo. The use of the name "Gorgo" is more telling as there was an actual tyrannosaurid theropod dinosaur living in North America during the Late Cretaceous Period called a "Gorgosaurus". This dinosaur did not look anything like the creature of the motion picture. but does resemble it in the advertising posters somewhat. Louire originally planned to have the movie set in Japan as a homage to Toho's "Gojira". This is very interesting, because at the time of this movies release there were only four known versions of "Gojira"and two were Americanizations of the original Japanese. Those known versions were the original 1954 film mentioned in the portion of this article for "The Beast from 20,000 Fathoms". That film's Americanized version from 1956 "Godzilla, King of the Monsters". Then there was the 1955 Japanese sequel "Gojira No Gyakushu (Godzilla's Counterattack) which was re-edited with added footage in 1959 as "Gigantis, the Fire Monster". To most fans of "Godzilla". The franchise would not start until the year following "Gorgo" with 1962's "Kingu Kongu Tai Gojira( King Kong vs Godzilla)". The location of the story was first changed to France, then Australia was considered and finally the British Isles. Again I could not find any references for these choices, or why Japan was not used. Six years after the release of "Gorgo". Toho Studio's released "Kaiju-to no Kessen Gojira no Musko (Monster Island's Decisive Battle: Son of Godzilla)" with a similar parent to child relationship, but not the destruction. One has to wonder what influence on a possible "Gojira/Godzilla" Franchise, if any, there might have been had Lourie made this film in Japan? Once more Eugene Lourie was the director of his third Giant Sea Monster motion picture. 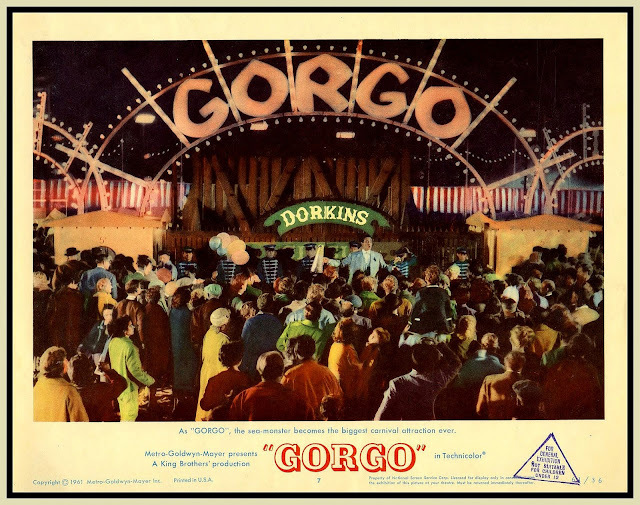 The producers of "Gorgo" were Frank, Maurice and Herman King whose company was "King Brother's Productions". Back in 1957 the brothers had a connection with Toho Studios. They released an Americanized version of Toho's 1956 "Sora no Daikaju Radon (Radon, Giant Monster of the Sky)" as "Rodan! The Flying Monster" aka: "Rodan". The connection to Japan continues in Eugene Lourie's choice of the fictional Irish Island of "Nara". Nara was a period in Japan's history from 710 to 794 A.D. I am speculating, but the name probably was in the original story Lourie wrote for shooting in Japan and might even go to his planned homage of "Gojira". As "Gojira" first appeared in the 1954 motion picture on an island named Ohto. The story revolves around three people two men and one boy. Playing Captain Joe Ryan was Bill Travers. I remembered him from a 1955 movie called "Wee Geordie" about a Scotsman who competes at the 1956 Summer Olympics in Australia. Otherwise he was basically unknown in this country by most Americans. Playing his partner Sam Slade was William Sylvester. Sylvester was seen as Dr. Heywood Floyd in Stanley Kubrick's "2001: A Space Odyssey". He also appeared in two excellent British horror movies 1964's "Devil Doll" and 1965's "Devils of Darkness". The role of the young boy Sean was portrayed by Vincent Winter. He had appeared in 1953's "The Little Kidnappers" and would be seen in Walt Disney's "Greyfriars Bobby" also in 1961 and Disney's "The Three Lives of Thomasina" in 1964. Winter would become a production manager on such films as "Superman" 2 and 3, "For Your Eyes Only" and "Indiana Jones and the Temple of Doom". Captain Ryan and his First Officer Sam Slade are salvaging for treasure off of the Irish Coast near Nara Island. An undersea volcano erupts and their ship is damaged as a result. The two have to take their ship to Nara Island for repairs. Around the island as their ship approaches are floating dead fish giving the two men the impression something strange is happening, if this sounds somewhat familiar. The screenplay was co-credited to Daniel Hyatt. Hyatt is actually Daniel James who co-wrote the screenplay for "Behemoth the Sea Monster" with Eugene Lourie. Ryan and Slade meet with the Harbor Master who is sending out local men to search for treasure and considers the two men his competitors. Some of the Harbor Master's men have disappeared and one of them died of fright. That night a 65 foot sea monster comes out of the harbor and attacks the town. It is driven back into the ocean. As Captain Ryan and First Officer Slade investigate they discover the creature is called "Gorgo" according to a local Irish legend. They meet a young boy named Sean who is critical of the two men, because they want to capture the creature. Sean believes "Gorgo" must be left alone. Using a diving bell to look for "Gorgo", again sound familiar, the creature is spotted and lured to the surface. Ryan, Slade and their crew manage to capture the creature, but Sean attempts to free it. Word has gotten out about the discovery and scientists from a local University arrive on Nara to study "Gorgo". By this time Captain Ryan has been offered a considerable sum of money from London's "Dorkin's Circus" to display "Gorgo". Sean had stowed away on the ship and he befriends Sam Slade. While Captain Joe Ryan's personality has changed from the money he is receiving from Dorkin. Both men are called to the University where one of the scientists has made a discovery. "Gorgo" is only an infant. CUT TO NARA ISLAND as Mommy comes out of the water. All 200 feet of her. She proceeds to destroy the town and heads for London following her child''s scent. Her name is "Ogra". The Admiralty sends out warships which are sunk by "Ogra". "Ogra" will come ashore in London.traveling up the Thames. She will fight the army and jets to rescue her son. In the end she wins and the two leave down the Thames to the open sea and home. Unlike his two previous sea monster films "Gorgo" also pays homage to Ishiro Honda and Eiji Tsuburaya's "Gojira" by using suitmation. Playing the roles of "Gorgo" and his mother "Orga" was ex-jockey and stunt man Mick Dillon. Dillon would play a Triffid in 1962's "The Day of the Triffids" starring Jannette Scott, Howard Keel and Kieron Moore and a Dalek in 1965's "Dr. Who and the Daleks" starring Peter Cushing. On May 26, 1991 Eugene Lourie passed away from a stroke at the Motion Picture and Television Hospital in Woodland Hills, California. He was 88 years old. Some of Lourie's other films included the war drama "The Battle of the Bulge", "Custer of the West" and Clint Eastwood's "Bronco Billy". On television he was Art Director for 63 episodes of David Carradine's "Kung Fu" and two made for television movies for Irwin Allen: 1976's "The Time Travelers" and 1978's The Amazing Captain Nemo"> His television work started in 1952 with the crime drama "Racket Squad". He was a very versatile contributor to both the motion picture and television industry.